Houses with pools certainly tend to sell for more money—but how much is that inground pool really worth? In certain climates—temperate to hot ones, mostly—houses with pools are practically idyllic. When summer lasts five or six months and temperatures are easily 100 degrees or higher on the hottest days, relaxing next to (or floating in) a pool in your own backyard is a dream come true. If your home doesn’t already have an inground pool, though, adding one is no small project. Installing an inground pool—the kind of permanent structure you can enjoy for years to come—can take months and cost tens of thousands of dollars. According to HomeAdvisor, the average inground pool cost is almost $50,000, and larger pools or pools with special features can have even higher price tags. 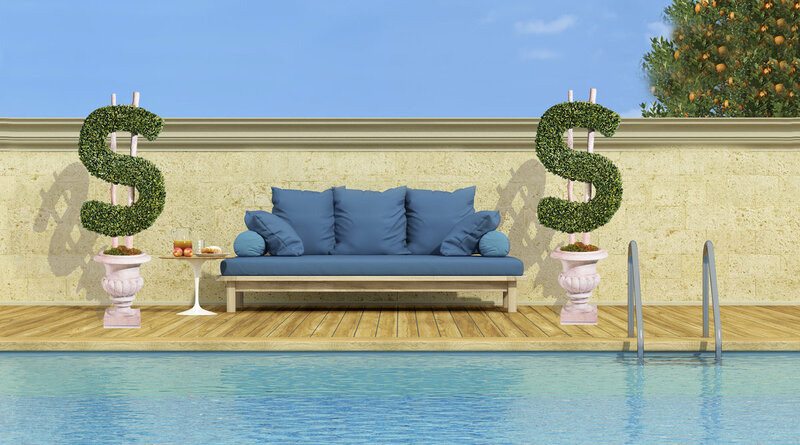 As with any costly home upgrade, you’ll want to make sure adding a pool will pay you back in more than just summer memories. Just as getting the timing right for the best time to sell a house and picking the right house paint colors can increase your home’s value, adding a pool can bring a lot of added value to your home, and a new analysis from real estate brokerage Redfincalculates exactly how much. The analysis calculates the value of a private pool as a premium to a home’s per-square-foot sale price in metro areas where houses with pools for sale are relatively abundant. In certain regions, having a pool is a major perk, and home-buyers are willing to pay extra for it: A pool can add $95,000 to a median-priced home’s value in Los Angeles, California, for example, and almost $30,000 to a home’s value in Tampa, Florida. Redfin’s analysis was limited to 19 metro areas—regions had to have at least 5,000 homes sold in 2018 where at least 2 percent of sold homes had pools to be included—but the variety in pool values proves that the true value of an inground pool really depends on where you live. Added value from a pool in areas included in the analysis ranged from $11,000 in Phoenix, Arizona, to $95,000 in L.A.
Of all the home updates that might increase home value, an inground pool probably isn’t at the top of the list (and it certainly isn’t the sort of thing you’d add to a last-minute home-selling checklist), but if you live in an area where having a pool in the backyard is popular and common, it may be a major boost to your home’s value when it comes time to sell. Until then, you’ll make plenty of happy memories with your own private pool.